Portland has long had a reputation as one of the most bicycle-friendly cities in the nation. We can all be proud of Portland and Oregon’s commitment to healthy, environmentally-friendly transportation. Even in Oregon, however, cycling can be dangerous. The National Highway Traffic Safety Administration reported 10 cyclist deaths in Oregon in 2008. Nationally, between 700 and 800 bicyclists die each year, most of them in accidents involving cars or trucks. Those 10 Oregon deaths represented 2.4% of the state’s road fatalities, according to NHTSA – a figure significantly above the national average of 1.7%. Contrary to what some people believe, bicycles are not supposed to be ridden on the sidewalk. The law considers a bicycle a vehicle. As such it has just as much of a right to be operated in the road (freeways excepted) as any car or truck. Drivers who fail to understand and acknowledge this endanger not only law-abiding cyclists, but themselves and other motorists. Oregon law requires large commercial delivery trucks to have special mirrors that allow the driver to see objects – such as bicyclists – directly in front of the vehicle. It also requires drivers to pass cyclists only on the left and only at a safe distance. According to the Oregon DOT, when the road has a speed limit of 35 mph or more and does not include a dedicated bike lane, a “safe distance” is defined as giving the bike rider a wide enough berth that he or she would not be struck by the motor vehicle “if the cyclist were to fall into the driver’s lane of travel”. Of course, cyclists have responsibilities as well as rights – they need to follow the law with the same care as motorists: observing stop signs and traffic lights and signaling when they intend to change lanes, for example. 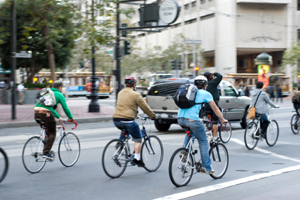 As a Portland bicycle accident lawyer, Matthew Kaplan has years of experience in helping cyclists fight for enforcement of the rights they enjoy on Oregon’s roads and streets. If you are a cyclist and have been involved in an accident, particularly one involving a car or truck, a consultation with the Law Office of Matthew D. Kaplan, LLC can be an essential first step toward receiving the justice you are entitled to, and compensation for your injuries.